EA has released the official launch trailer for upcoming racer Need for Speed: Rivals. The launch trailer focuses on the story aspect of the game, with voiceovers from the game’s protagonist. The game is already available in North America for the PS4, and will be available on the PS3 and other platforms this week, with the PS4 version coming to Europe on November 29th 2013. The game features open world with a greater emphasis on cops vs racers. 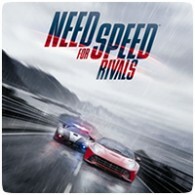 Much like the previous Hot Pursuit games, Rivals will let players play as both racers and cops, moving up the ranks in their respective “faction” and unlocking new customisation options.